Next Month: April is Active Directory month! Become a Citrix Hero in April! DJ still offers consulting services! Remember, every time you read Fake News, God lets a little kitten die. Do it for the kittehs! That said – I think the suspected pattern of attack leads me to once again recommend that everyone use a password manager instead of trying to remember their own passwords. You can find more about this on our Resources page, but I have been wisely trusting Dashlane to help me with exactly this leading security practice for over 2 years. If you are already using a password manager, great! But everyone should. And- my friends at Dashlane will give you 6 months free access! The cool thing for me is that they also give me 6 months as a thank you, so we both win. Try Dashlane for free. I have decided to serve another year as a Citrix Technology Advocate. This is not a role I take lightly – and Citrix is listening to what you are saying thru me. In fact, if you would like to anonymously give myself or Citrix some feedback and haven’t filled out my reader survey, head here. Also – I recorded a quick video with some tips of how you can plan on becoming a CTA this year and posted it to LinkedIn. ed – An updated list of CTAs can now be found here. The Citrix Technology Professionals program got more entrants this year than they have ever gotten, and the selection was certainly not easy based on my conversations with a few CTPs. Eventually, however, the list of these qualified and passionate individuals was paired down. Even a few CTAs have moved on to join the CTPs – sorry to be biased but I’m especially proud of these individuals! Synergy 2018 will be held in Atlanta, Georgia on May 21-23rd, however there are activities before and potentially after the event. My friends Ruben, Mark and Christiaan are once again doing their VDI Like a Pro survey. As a favor to me, fill out this survey! The results are very important to get a dispassionate view of what is really going on with End User Computing (EUC). Every year gains insights as to where I should focus and, frankly, who’s ‘winning’ when it comes to the technologies out there. Give your honest responses right here: https://vdilikeapro.com/state-of-euc-2019/ it will only take a few minutes! Enrollment in the Citrix Hero Program is currently closed while we work a few structural changes and best test a few things. Enrollment will re-open April 15th. We’ll email everyone when it’s ready, but if you would like to help out with a quick focused survey I’ll give you your first 45 days free and make sure you’re first in the door! Old School folks like me remember what it was like to live in a world without provisioning technology making one build work for many builds. Some of you are still in that world (and probably shouldn’t be). For those of us that have embraced the change often wonder if we did it right. In my travels, what I have discovered is that… no. Most have been close but not quite there. Symptoms of improperly tuned PVS (or MCS) VDAs usually include mid-day slowdowns, storage usage higher than expected (yes, we really can get down to near-zero IOPS), even after optimizing as described in Chapter 1. Part two of this chapter deals with a second issue I often find- PVS Server slowdowns. Here I address the myth that PVS needs fast storage (it straight up doesn’t) and how to properly size memory to deal with the vDisk workloads you have (in the real world, not just a magic formula). You’ll have the opportunity to get this lesson in April, either by joining the Program or I’ll be making this chapter and lesson available for standalone purchase soon as well. April is Active Directory Month! 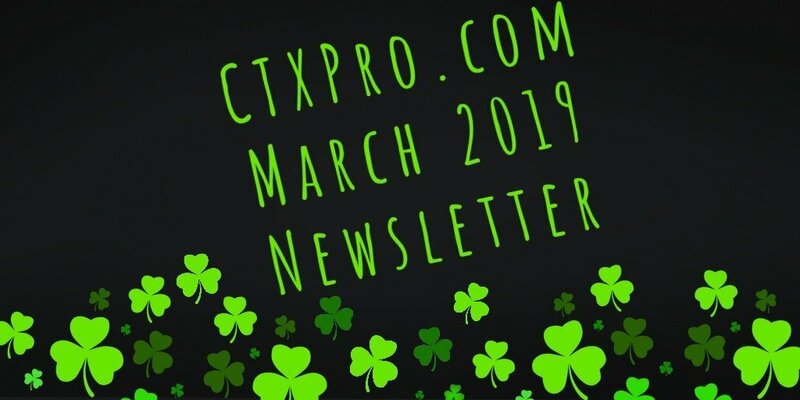 First off, we outlined some of what DJ’s been up to on this blog post: https://ctxpro.com/march19-presentation-madness/ But… there was actually MORE! Last month I had a week free so I did something kind of crazy- I declared the whole week Citrix Hero Week and spent more time than I ever have before on social media, webinars and just around in general to serve folks and let even more of this knowledge in my head OUT for the world to benefit. We introduced the Citrix Hero Program and gave founding members a very special price (sorry to report that this is price will never be offered again but there will be a special launch price coming in April). You can view replays of the live sessions on YouTube, Facebook, LinkedIn and Twitter. On March 12th, I gave a special webinar for eGInnovations discussing my 7 “Do this, not that” tips for being successful in the Citrix world. This was a rather unique opportunity to not only speak to HOW do technical things, but more importantly WHY to do them. I feel this crucial step gets missed too often. Trust me, if you don’t have a firm grasp on the question of WHY in the IT industry, you’ll be stuck where you are for a long time. I created a special printable guide you can use for the replay and have an email with additional questions we didn’t have time for in the webinar. Register for that here. On March 5th I was honored to travel to Columbus, Ohio to present on the main things I’m looking for as a Citrix Consultant. If you’d like me to give a presentation for your local group, company or even if the topic interests you enough you’d like me to do a webinar on it, let me know you’re interested! Not to throw down the gauntlet too hard here, but I’ve submitted seven tips so far. I know for a fact that many of you reading this right now have 250 words you use to describe what you’ve learned in your journey to the Cloud. So- share it now! My friend Bas van Kaam has been hard at work not only on the Byte-Sized Book but also re-releasing his own book on the Inside Citrix: The FlexCast Infrastructure. This is an update on his prior work that, yes my Friends, has been updated to include Citrix Cloud’s impact on FMA. on LinkedIn or Facebook right now! Do it and make sure you tag me so I can say thank you! My next book project is moving forward as well. I have learned so much over the years by trial, error and sometimes by shouts directed in my general direction. My hope is to share with people those lessons that were hard for me to learn in an entire IT Methodology package over a decade in the making. I call it RiskLESS Methodology because it is centered around reducing risks by applying a simple to follow (or modify) system. This is not a technical book, but something I hope will become a guidepost for people wanting to grow their careers. In other words, I have more WHY behind this project than nearly anything I have ever done. So much so that I wanted to delay doing it until I got the Citrix Hero project going. However, I have committed to having the entire rough draft done and ready for a review prior to sending to my editors. This is the first phase in my Beta process and I have to admit may be the most scary part of it because I’m sending people a very rough product. None the less – if you want to be a beta reader and help make sure I haven’t made any silly misspelling, grammar or other errors – you’ll not only see this work before anyone else but you’ll also be given a copy of the final release for your trouble – for free. You’ll also have the opportunity to join my launch team and earn bonuses and even referral rewards (as in, you earn a percentage of my profits of the book) as part of the team. I’m only allowing 20 Rough Draft reviewers. If you are willing to help me please let me know! Enrollment re-opens to the public on April 15th! If you’d like to get on the waitlist, you can do so by filling out this brief survey! As a thank you, you will qualify for up to 45 days of free access to the program! For the launch of the new program we’ll be doing quite a few special things – giveaways, webinars and I’m even working on a career assessment tool I think you’re going to get a lot out of. I’m open to suggestions as well; one of my favorite ideas is to have a competition for the fastest logons! Stay tuned! As I mentioned, I’m declaring April to be Active Directory Month. However, I’m going to suggest some prep ahead of time. Active Directory is actually crucial for Citrix. You quite literally cannot run CVAD without it, and it is important for just about every other technology they have. Now I know this won’t be for everyone but my buddy Jeremy Moskowitz is quite simply THE MAN when it comes to Active Directory. If the name sounds familiar- think GP Answers. The guy has forgotten more about Active Directory and Group policy than I have probably ever learned… and I’m no slouch in Active Directory. So when I tell you that you have the opportunity to learn from Jeremy in a class he has created, hopefully you’re paying attention. Happening April 9th to the 11th in Tampa, FL I think this course is going to be a great way to SERIOUSLY UPGRADE your career by learning to be a better administrator. But more importantly, you’ll learn how good design, how Group Policy really works and importantly how to troubleshoot Group Policy and MDM. Why is this important? The number one complaint people seem to have about “Citrix” is logon times. Do you know what most often causes longer logon times? GROUP POLICY ISSUES!!! Yet, Microsoft doesn’t really have a good education resource focused on it. Fun fact- the reason I was hired as a Resident Consultant at Citrix Consulting wasn’t what I knew about Citrix. IT WAS WHAT I KNEW ABOUT ACTIVE DIRECTORY AND GROUP POLICY! So do yourself a favor and learn more about it. It is important literally everywhere in IT. DJ is still an active Independent Consultant. If your company is interested in a health check or Infrastructure Assessment. Have your company email [email protected] and ask about our Spring Cleaning special on Assessment and Remediation projects. We have openings for April available for remote or on-site. This is a rare opportunity for you to essentially have someone else pay for a week of practical learning as we work together to determine how you can identify what needs to change in your CVAD environment… and what doesn’t! As a member, your referral will in most cases make you eligible for additional time with me that would normally cost you several hundred dollars. Thanks for stopping by! Remember to keep an eye out for all the great things coming up in April!!! Monthly curated news. None of the fluff. We only publish what matters to the Citrix community and benefits you.